Made with fresh arugula, peaches, mint, shallots, and KRAFT Oil and Vinegar Dressing, this colourful side salad is sure to be a hit at your next potluck. Mix dressing, shallots and garlic until blended. 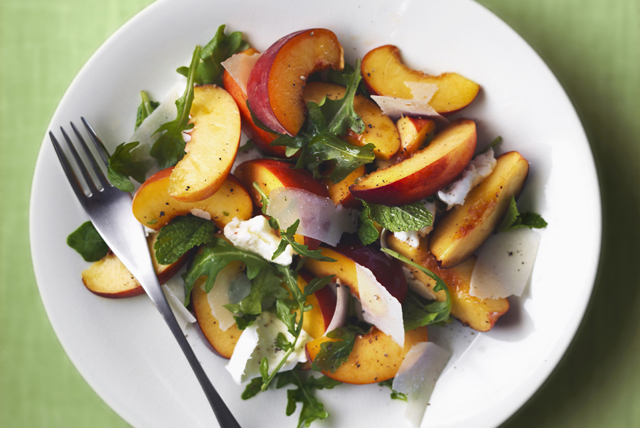 Toss arugula with peaches and mint in large bowl. Add dressing mixture; mix lightly. Top with cheese. For extra flavour, grill the peaches. Heat greased barbecue to medium heat. Cut peaches in half; remove pits. Brush cut sides of peaches evenly with 1 Tbsp. dressing. Grill peaches 6 min., turning occasionally. Cool, then slice and use as directed. Add 1/4 cup sliced toasted almonds to salad before tossing with the dressing mixture.